Reach Paradise: What Was it Really Like? I spent a lot of time this week wondering what that first Nativity scene was really like. And after a lot of research, here are some interesting perspectives on that miraculous day. 1) The birth of Christ probably did not happen in December. Luke's account alone helps us figure that out. He writes about the angel appearing to shepherds "keeping watch over their flocks at night". History tells us that December nights were pretty cold, and shepherds did not keep watch at night much past September. Scholars also think it would have been odd for the Romans to require travel for census during the winter months. They most likely would have done it before the winter, but after the fall harvest. That would narrow the timing down to late September or early October. 2) We don't know when Mary and Joseph arrived in Bethlehem. Luke simply tells us that "while they were [in Bethlehem] the time came for the baby to be born. So the scene in the movie The Nativity Story, where Mary is in labor upon entering Bethlehem may or may not be true. 3) It's quite possible Joseph stayed with relatives in Bethlehem, and did not go looking for space in an inn. The word that Luke uses, kataluma, was originally translated to mean "inn". But many scholars have since indicated the word means "a place where a traveler would sleep or stay". Back in those days, that usually meant an extra space or room in a house. Perhaps because of the census, the usual guest rooms/spots in Joseph's relative's house were taken or being used by elders. Or perhaps Joseph and Mary wanted some privacy and opted for more a private, albeit, unusual place. 4) Our Savior was born in a manger, but probably not in the stereotypical wood structure. And maybe not even in the storied cave-like structure. It is important to note that many homes in Bethlehem in those days were split into two floors. The family lived on the upper floor, and the animals were relegated to the lower floor. Not only did that keep the animals protected, but in the colder months, the heat they generated would keep the family above warm. It is in that lower area that the manger would have been located. Which means it's possible our Lord was born in a house. That being said, scholars do think that some "lower levels" were actually built into caves in that area, so it is possible the manger was located in a cave-like structure. 5) Shepherds were pretty low on the social totem-pole, but were the first to visit and spread the word of our Savior's birth. I don't know about you, but I had this romanticized image of shepherds based on nativity statues. Young, clean cut men with a snow white sheep hung tenderly around their neck and a perfectly carved staff in hand. Shepherds in those days were not trusted. They were unclean (spiritually and physically). They smelled. They were poor. They were low class. And yet, these are the people that God chose to be the unlikely first visitors. Just as He chose a poor child to bring us salvation, He chose the lowest of society to be the first messengers. 6) The magi (however many there were) did not arrive the night of Jesus' birth. First things first, nowhere in the bible does it mention how many magi there were. Because Matthew mentions the three gifts, common storytelling mirrors that with three wise men. But we don't know that for sure. 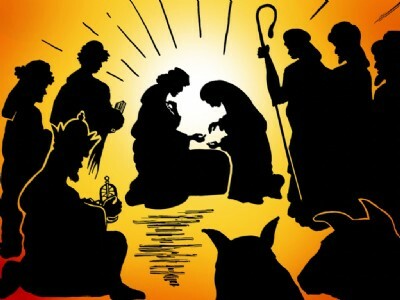 Second, most experts believe that the magi did not arrive until after Jesus was presented in the temple. There are clues in scripture that could support that conclusion, including Herod calling Jesus a child (not baby) after speaking to the magi, Herod killing children up to 2 years old instead of newborns, and the fact that Matthew tells us they visited Jesus in a house, versus the manger. Does any of this change the importance of Christmas? God Bless you as we enter this final week of Advent. Thanks Michael. I always enjoy a little historical fact. It puts the scenes of Scripture into their physical backdrops. And I agree none of this, no matter what day Jesus was actually born matters, just that He was. A blessed final week of Advent to you as well. Interesting to read about. I agree with Karinann. Have a blessed week! Have a blessed week. Best wishes. Hmmm...kind of takes away the mystery of the Nativity Scene when you put it into realistic terms. I've no doubt that your description is more accurate but I will hold on to my child-like memories of it! Merry Christmas!